Talk to strangers, find clues, and fetch ingredients for a giant collective dinner party! Grab some friends and traverse remarkable neighborhoods in New York City. Talk to strangers, find clues, and fetch ingredients for a giant collective dinner party! Massively Multiplayer Mu shu is the latest in our series of team-based urban games focused on culture, food and language. 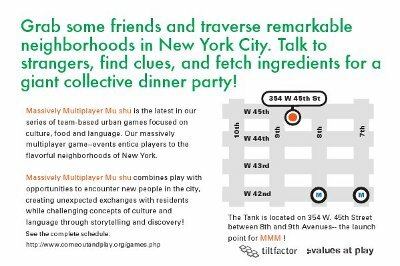 Our massively multiplayer game--events entice players to the flavorful neighborhoods of New York. Massively Multiplayer Mu shu combines play with opportunities to encounter new people in the city, creating unexpected exchanges with residents while challenging concepts of culture and language through storytelling and discovery! Collect the ingredients and earn as many points as you can in the time allotted! Get your Ingredients first! Find people to translate your Ingredient Cards and purchase the items written on them! Save your receipts and only acquire one item per location. Use your Encounter Card to interview people you meet, and record their answers on the voice recorder! Answer questions from Bonus Points Card! Convince someone from the neighborhood to come back to dinner with you! Each team is given a colored packet containing their team's materials, a CLUE, and a map of their region of the city to explore with a star indicating their target location. They begin by finding the best way to travel from MMS Base to this target. Players go to the target location. When players have arrived at the right location, they must locate the Keeper at this place to receive their package of missions. A. The packet contains several essential food ingredient mission cards to be acquired. The ingredient name has been translated into three different languages. Players choose one of the cards and must engage with local community members to hunt down someone who can read and translate one of these languages in order to find out what they must bring back for dinner! B. Players purchase the ingredient. Each ingredient must be purchased from a different store and brought back to MMS Base, along with a receipt for verification. Players must return with all items to register their points. Players can ask each person they encounter a number of questions for points, and all encounters must be documented with the provided voice recorder. Questions are all centered around memories of food, and designed to prompt interactions and storytelling between players and the people they meet in the neighborhood. Encounter cards encourage spontaneous singing, acting and conversations in the streets! Points are awarded for the best story, with points increasing for more complex interactions. Final points will be decided by a panel of judges. As the three-hour game clock winds down towards dinnertime, the Team must decide if they have time to complete Envelope Three's Bonus missions. Players may complete as many of the bonus missions as they have time for. Bonus Point Cards are missions in which players explore the neighborhood and find out local factoids about its ethnic history. Some of the Bonus Fetch Cards contain riddles or clues about specific places in the neighborhood that the Team must decipher. Upon arriving at these locations, the Team must find the answer to the question as verification of their success! RETURN TO MMS BASE ON TIME! All food must be brought back to MMS Base within the allotted time, along with other stories and evidence. 10 Points are deducted for every 10 minutes late. Points are counted for the food collected, and the quality of interactions, with bonus points for history cards. MASSIVE SOBA DINNER PARTY! for all players! All teams bring back their food. One big delicious meal is shared by all! The Tiltfactor Laboratory is the first academic center to focus on critical play-a method of using games and play to investigate issues and ideas. Our mission is to research and develop software and playful art that creates rewarding, compelling, and socially-responsible interactions, with a focus on innovative game design for social change. We recognize that play comes in many forms: competitive, subversive, embodied, exploratory and our work explores ways to use diverse design approaches to appeal to a wide range of players and learners. We�re also interested in playculture-how play permeates everyday actions and routines-and we seek ways to infuse playfulness into common interactions. Our aim is to make effective interventions in thinking about how games, and software in general, can evolve to support social and educational principles for diverse audiences.